Bibimbap in Korean means "mixed rice". It is traditionally consumed at home and incorporates fresh garden ingredients. Here there is an updated twist by using quinoa instead of rice! 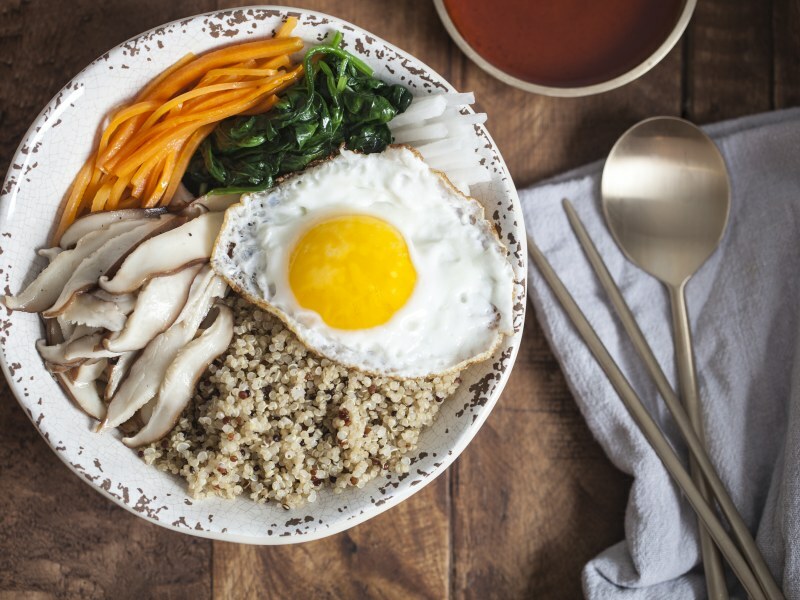 This recipe uses a lot of similar ingredients you find in Korean food which include spinach, carrots, radish, and shiitake mushrooms. They are all tossed in a flavorful vinaigrette of Korean red pepper paste, rice wine vinegar, sesame oil, sugar, soy sauce, and sunflower oil. 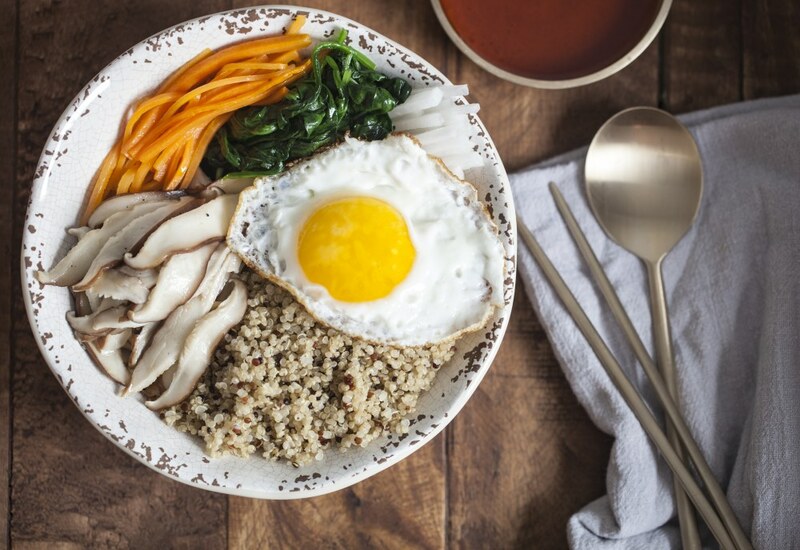 The bowl is topped with a fried egg to make a complete meal. Gochujang is a popular Korean chili paste with a spicy and bold miso-like flavor. It adds remarkable heat and depth to any dish. Per Serving: 396 calories; 23g fat; 37.3g carbohydrates; 12g protein; 186mg cholesterol; 1132mg sodium. Sometimes I run out of ideas for how to cook quinoa, my favorite sea grass. The vinaigrette that is included in this dish tastes super fresh, I will probably make this for other salads as well. Pretty good weekday lunch! This Korean bibimbap is very traditional and authentic. The vinaigrette was easily one of my favorite parts of this dish. I used quinoa but it also goes good with brown rice. This was a really good quinoa bowl. The mushrooms and egg were my favorite additions. Next time I will sub out quinoa for noodles. The vinaigrette was also amazing. Not sure if the type of quinoa makes a difference, but I used white quinoa for this recipe. I couldn't find gochujang, but I found something similar that worked well. It was pretty tasty. I couldn't find gochujang or Daikon radishes, but made due with sriracha and red radishes. I also used a soft boiled egg I made in my pressure cooker (recipe on this site). It was a delicious bowl, so glad I tried something new.